We had a fantastic night at our Christmas Concert on Wednesday night. The children performed to our biggest audience yet! A huge thank you to all who supported the children on the night. Thanks again to Seán Dwyer for filming all of the performances on the night. You can find a link to each video below. Our Parent Association are holding their annual Easter Bake Sale on April 1st, Easter Sunday. The Bake Sale will take place in the school after 9:30am Mass. Members of the PA will be available to collect baking from 6pm to 6:30pm on Saturday evening, or before Mass on Sunday morning. All proceeds raised by the PA are raised in aid of Craggagh National School. Thank you for your help as always! As part of the St Patrick’s Day Festivities in Kiltimagh, we participated in a lovely evening of poetry and song with our friends from St Aidan’s NS. The event was hosted and facilitated by local poet, Terry McDonnagh. In the weeks leading up to this evening, Terry visited the school a number of times and conducted poetry workshops. Using the theme “Journeys” the children explored the life of Raifteirí through poem and song. The children composed their own works, some of which were performed on the evening. Thanks to Terry, Poetry Ireland and the Tourism Association in Kiltimagh. You can find out more about Terry’s work here. Anthony Broderick, author of The Adventures Jack and Adam series of children books, visited us this week to talk about his work as an author and as an entrepreneur. So far, Anthony has published 3 books in the Jack and Adam series. Anthony spoke at length about the writing process, what inspires him and what drives him. He had lots of great tips for the children to help them with their own story writing. Anthony also spoke about the business side of writing. There’s a lot of work behind the scenes, dealing with publishers, retailers and customers. This part of Anthony’s visit was especially interesting for us as we embark on our Junior Entrepreneur Project. You can find out more about The Adventures of Jack and Adam here. We have embarked on another Junior Entrepreneur Adventure! Our company is still in its infancy, and is as yet unnamed. However we had a very productive workshop last week with “Heritage Expert” Mark Wilson. We began production of our recycled copper key-rings and wooden key-ring holders. We had a very busy assembly line with children hammering, filing, cleaning, and shaping our products. We are absolutely delighted with our finished product. They will go on sale after the Easter holidays, with pricing yet to be determined! Have a look at the pictures and videos below. We had a brilliant day with “Heritage Expert” Mark Wilson last week. Children from all classes learned about the many uses of the willow tree (sally) as well as a range of other traditional wood crafts. As you can see form the images below, we had great fun making bunny faces, just in time for Easter! We are very thankful to our Parent Association for funding this workshop. The workshop is also part funded by the Heritage In Schools Scheme. The school will close at the earlier time of 12pm on Wednesday, February 14th. This is also the day that the mid-term break begins. We will reopen again on Monday, February 19th. This half day closure, in accordance with Circular 0081/17, is to facilitate staff training in the new Child Protection procedures which came into law on December 11th, 2017. The Board of Management has recently ratified a new Child Safeguarding Statement (policy) for the school. This is available to view and download on our blog. The staff and Board of Management have also conducted a “Child Safeguarding Risk Assessment”. This too is available to view at the same link. Both of these important documents will be reviewed annually by the Board in the first term of each year. The full Child Protection Procedures for Primary & Post Primary document may be viewed on the Department’s website at this link. All teachers will be available until 5pm on Tuesday evening. For your convenience however, there are also a number of other time slots available throughout the week with all teachers. Please let us know if you have any difficulty making an appointment! The Area 8 Mini 7s trophy will spend (some of) the winter in Craggagh for the first time ever following today’s blitz in Swinford. A combined team of Craggagh and Straide emerged victorious from a pulsating day’s sport. Victories in the early rounds against Meelick and Midfield/Culmore saw Craggagh/Straide coming up against Foxford NS in the final. Foxford had come through two epic encounters themselves having edged out Kiltimagh in their opening game and being brought to extra time by Bohola. Extra time was needed again in the final thanks to a great comeback in the second half by Craggagh/Straide who were trailing by 4 points at half time. In the end, Craggagh/Straide prevailed by 3 points in a hugely entertaining game. Credit must go to both teams for such a great contest. Meanwhile, our girls were unlucky to miss out on completing a double, going down in the final to an excellent Bohola team. Our girls’ path to the final was similar to that of the boys, defeating Meelick in the first round and edging out Midfield/Culmore in the semi-final. The final saw Bohola win out by 3 points in a very keenly contested game. Many thanks to those who organised today’s events, teachers, referees and all who helped out. We await confirmation of who the boys will play next. 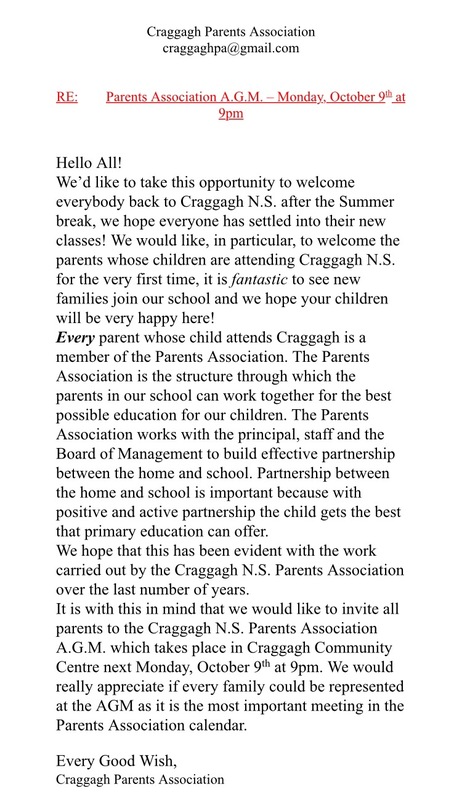 Our Parent Association AGM will take place in the Community Centre on Monday, October 9th at 9pm. Modern Dance with Nikki – Videos from today’s performances! After 7 weeks of rehearsals, we finally got the chance to share our performances with you! Well done to the children in all classes who worked so hard on their routines and to Nikki herself. Thanks again to our brilliant Parent Association who fund these dance lessons. We are setting up an After School Childminding Facility in Craggagh NS from September 1st 2017. The facility will be located in the school building (downstairs classrooms) and grounds and will operate from 3pm to 6pm, Monday to Friday. Infants availing of the facility will be supervised from 2pm to 3pm. Parents availing of the After School Childminding Facility will be able to apply for grant assistance to partially meet payments under the Government’s new “Affordable Childcare Scheme”, which commences in September 2017. Nevertheless, we will be keeping costs as low as possible. This is not a profit making endeavour. Before we fully establish this facility and outline the cost to parents, we need to ensure that it is viable. Please complete the survey below to help us gauge the level of interest in this facility. This survey will close on June 9th and we will confirm details of the facility by mid-June. Please do no hesitate to contact us with any queries.